Drugs for livestock treatment | Infonet Biovision Home. As Kenya and East Africa in general has a very low population of trained veterinarians, farmers need to learn to deal with emergencies that happen when the vet is not around. Most environments in Africa have a high disease challenge, and the serious farmer need to learn how to deal with this in order to have healthy, happy and productive animals. Drugs are allowed in organic farming as per veterinary recommendations but alternative medicine is preferred. Preventive use of drugs is forbidden and antibiotics can be used a limited times, with a double withdrawal time. Animal health care is still not sufficiently developed that we can keep livestock healthy without veterinary drugs. In Europe and the USA great progress has been made towards the use of homeopathic veterinary medicine which in many instances has shown its applicability to certain health problems. In Africa ethnoveterinary solutions are also commonly used and to some extent may be effective where an experienced herbalist has been consulted. Much of this is not well documented and verified as effective but a lot of farmers use it with good results. In order to keep livestock healthy it is very important to observe strict adherence to recommended vaccination schedules recommended by your veterinarian, who should be familiar with the kind of diseases occurring in your area. Vaccines are active or inactivated disease organisms used to boost immunity of the livestock from specific diseases. They have played a major role in eradicating some of the most dangerous diseases both in man and livestock such as smallpox in man and rinderpest in animals. Application of vaccines is a cheap way of protecting your whole flock against devastating diseases, such as Newcaste disease, which cannot be treated and can kill all the chicken in an entire village. Another example of a deadly disease which can kill all your goats and half of your sheep is Goat Plague or Pest of small ruminants (PPR); there is no treatment against PPR but it can be prevented by vaccination. Keeping up to date on which vaccinations are important for success of livestock in your area is a very important management tool. Vaccines need to be kept constantly chilled in a fridge or frozen (depending on manufacturers instructions), as they deteriorate rapidly and loose efficacy within hours when exposed to warm temperature. New, so called 'thermostable', vaccines are becoming available, which are more resistant to warm temperatures and can be kept for days (sometimes weeks) without cooling or freezing. Once a vaccine vial has been opened the whole contents should be used quickly. Unused vaccine remaining in the open vial cannot be kept for later use. It is advisable for several farmers to team up and have their animals vaccinated together on the same day. In this way they will share the costs for buying the vaccine, make full use of the vaccine vial contents and the vaccination becomes cheaper. Injectable Tetracycline or Penicillin solution Treating infections where the animal has fever. By Kenya law farmers are NOT allowed to use such drugs, but are required to call a qualified veterinarian to administer the treatment. Veterinary drugs contain substances, which are potentially toxic and harmful to humans. After giving a drug to an animal these substances remain in the animals' body for some time until they have been completely excreted. While these toxic substances remain in the body they can be found in the muscle (meat) and also in the udder (milk). A person consuming meat or milk from an animal that still has drug substances in its body will ingest harmful and toxic substances. To prevent this from happening drug manufacturers provide a withdrawal period for each drug. The withdrawal period is the time until all toxic and harmful substances have been cleared from the body (including from meat and milk) of the treated animal. If more than one injection has been given the withdrawal period begins after the last treatment. Before the withdrawal period is over, milk from the treated animal must not be consumed and the animal can also not be slaughtered for meat. For meat the withdrawal period may be longer than for milk. Drug dosage depends entirely on the animals body weight. 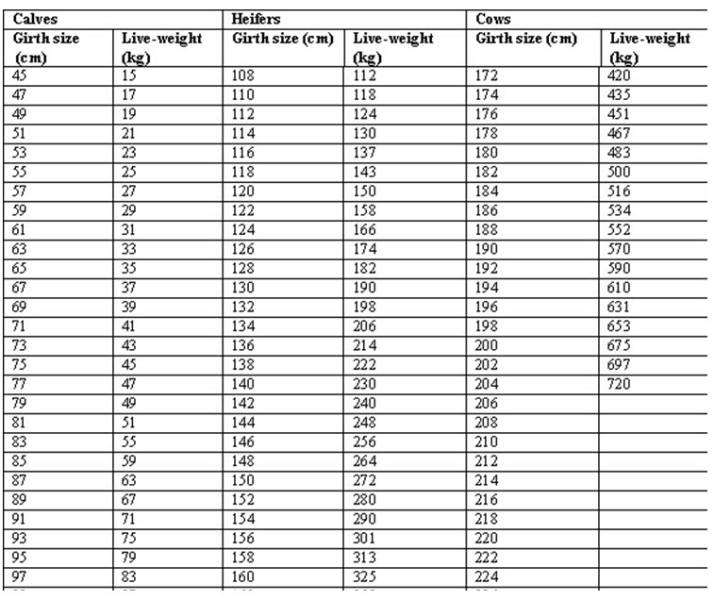 Whereas most farmers do not have access to weighing scales that can weigh animals, the body weight of cattle (and pigs) can be determined by chest measurements using a simple measuring tape available from Agro-Vet shops. Drug manufacturers provide dosage information, which is normally in ml (or cc) per kg body weight. Once the body weight of an animal has been estimated (in full kg), the drug dosage is calculated according to the manufacturers instructions. All drugs have a safety margin, so slight overdosing does not do any harm. But giving a too low dose can lead to treatment failure. Round up the volume of the drug to full ml (or cc) according to the calibration of the drench-gun or syringe. The dosage for a drug provided by the manufacturer ensures that the amount of the drug in the body of the treated animal is high enough to kill all bacteria or parasites causing disease. Because drugs spread to all parts of the body large heavy animals need more of the drug than light small animals. When administering less than the recommended dose the strength of the drug inside the body is low and kills none or only some of the bacteria/parasites. This is called underdosing - giving too little of the drug. The result of underdosing is either no cure, or an incomplete cure where the animal first improves but then relapses. To make matters worse, the remaining bacteria/parasites learn how to survive the drug and become resistant. So even when a full dose of the drug is applied later, these resistant bacteria/parasites are not killed and continue to cause disease inside the animal. This is called drug resistance. The drug no longer works. It is the same when treating worms inside the stomach and intestines. Large animals have bigger guts and need more of the dewormer. 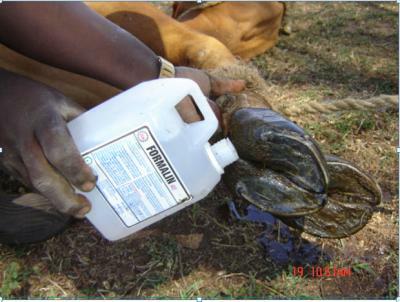 Because underdosing is very common in deworming, some anthelmintics/dewormers no longer work and farmers have serious problems deworming their livestock. To avoid the problem of drug resistance correct dosage, according to manufacturers? instructions must always be followed. A veterinary laboratory can check whether a particular drug or dewormer is effective or whether you have resistant bacteria/worms in your herd. Based on the lab results the best choice of drug for your livestock (e.g. for treating mastitis or worms) can be identified. Forse, Bill 1999: Where there is no Vet.